This particular heavy oil burners series has been developed in order to use compressed air or, alternatively, steam as a fluid to atomize the fuel which gives better combustion results when compared to the traditional atomizing systems. The range runs from 1600 kW to 3700 kW and are provided with a low pressure nozzle which allows consumption levels to be kept low, but, above all limits the general wear of the whole atomization system. 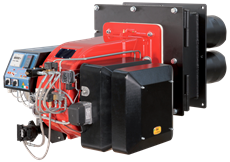 All burners are progressive, and are complete with electrical control cabinet, pump set to be installed separately by the final user, and the nozzle performs an automatic cleaning process at the end of each cycle. The plant must be provided with compressed air or steam at 8 bar. Burners are ignited through a pilot which can works both with natural gas or LPG (on request, available diesel pilot) and are suitable to be used with fuels up to 4000 cSt at 50 °C (530 °E at 50 °C). The standard burner is set up to atomize only with compressed air, when steam is requested for atomization, the burner will be modified through a specific kit.